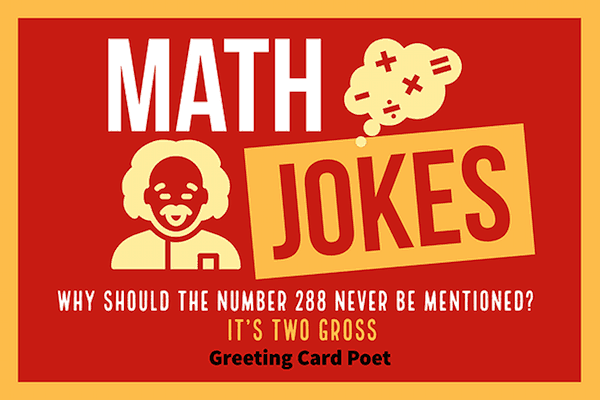 This collection of math jokes just might be enjoyable enough for mathematicians and for students alike to enjoy a laugh or two. The jokes and funny sayings contain something essential about math, the mathematical way of thinking, and also mathematical pop-culture. Maybe you’re trying to woo someone special in your calculus class? Maybe, it’s National Pi Day and you want to get a few chuckles from an audience? Or, maybe you’re just trying to impress your teacher? For whatever reason, the reason you’re here is because you’re looking for some good jokes and we have supplied a ton of them! Here’s a formula for laughs: just keep reading and enjoy these exponentially. Heard about the mathematical plant? Why is a math book always unhappy? Because it always has lots of problems. What tool do you use in maths? Why couldn’t the moebius strip enroll at the school? What does a mathematician do about constipation? He works it out with a pencil. Which tables do you not have to learn? Why don’t you do arithmetic in the jungle? Because if you add 4+4 you get ate. Where do math teachers go on vacation? What do you call friends who love math? Check out the Best Albert Einstein quotes. What is a mathematician’s favorite season? Don’t bother me, I’ve got my own problems. I saw my math teacher with a piece of graph paper yesterday. I think he must be plotting something. Check out these corny jokes. Why do plants hate math? Why did the boy eat his math homework? Because the teacher told him it was a piece of cake. Have you heard the latest statistics joke? What do you call an empty parrot cage? Why didn’t the quarter roll down the hill with the nickel? Because it had more cents. Why wasn’t the geometry teacher at school? Because she sprained her angle. Why was the obtuse angle so upset? Because it was never right. Why was the warlock so bad at math? He never knew WITCH equation to use. Where do multiplication problems eat breakfast? What did the spelling book say to the math book? What do you call a number that can’t keep still? What is the definition of a polar bear? A rectangular bear after a coordinate transformation. I just saw my math teacher with a piece of graph paper…I think he must be plotting something. Are monsters good at math? No, unless you Count Dracula. Why wont Goldilocks drink a glass of water with 8 pieces of ice in it? What’s the integral of (1/cabin)d(cabin)? What is the first derivative of a cow? Why was the parent function upset with its child? It was stretched to its limit. What is polite and works for the phone company? Why was the Calculus teacher bad at baseball? He was better at fitting curves than hitting them. What wild animal is good at calculus? What is the integral of log cabin d cabin? Log Cabin + sea = houseboat. What is purple and commutative? 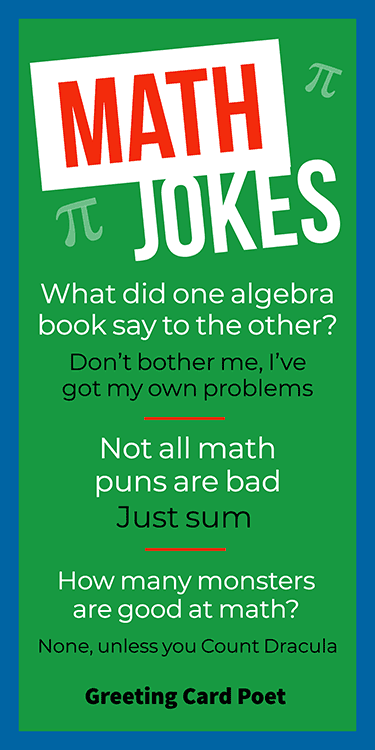 Note: Do you have any great math jokes? Let us know via the contact us page. I saw Pi fighting with the square root of two the other day…I told them to stop being so irrational. How do you know your math tutor is hungry? Why did the Pi get its driver’s license revoked? Because it didn’t know when to stop. What do you get when you take the sun and divide its circumference by its diameter? Remember not to eat too much pi—it will give you a large circumference. Having an argument with pi just goes around in circles. Statistics show that 3.14 percent of sailors are pi-rates. How many pastry chefs does it take to make a pie? Why do teenagers travel in groups of 3 or 5? What did 2 say to 4 after 2 beat him in a race? A farmer counted 297 cows in the field, but when he rounded them up, he had 300. Why did seven eat nine? Because you’re supposed to eat 3 squared meals a day. You’re on Math Jokes page.